The ECO Freshwater conference was an important occasion to hear more about the social, political and ecological challenges that New Zealand, as a multicultural community, has to face and manage. Most importantly, this meeting brought to light what are the key points on a modern decisions board in which many stakeholders from different backgrounds have to be equally involved. As an overseas PhD student this meeting was an invaluable source of information to better understand the New Zealand society and its approach to ecological issues. The freshwater system (river and lakes) in New Zealand is under ecological threat because of the intense dairy farming industry. Dr Joy and Dr Humphrey have clearly illustrated that Nitrate leaks and pollution can cause alteration of the freshwater ecosystem such as algae bloom, E. coli infections, irregular oxygen fluctuation -which can be deadly for aerobic organism such as fishes-, blue baby syndrome – that affects primarily lower-income families. As Al Fleming (from Healthy River) recalled freshwater health means a lot to New Zealand. “When you meet someone in Māori culture you say ‘ko wai koe’ and what that means is ‘who are you’ but if you take the translation out of it and just translate word for word it is ko meaning who and wai meaning water, so it is actually ‘which water source do you come from’“. This exemplifies how the freshwater ecosystem is important for New Zealand, hence the need to protect and manage it sustainably. Despite several attempts undertaken to manage the freshwater ecosystem and protect its resilience capacity from modern pollutants (e.g. Treaty of Waitangi) NZ does not recognize the right to a healthy environment at national and international level. However, Dr. Duncan highlighted a key point to better understand the ongoing decision tree for the best freshwater management within the Canterbury experience, using Jasanoff’s analysis (2004). Science and politics need to find the right balance to inform and make the (local, regional, national) communities conscious enough to independently face tricky issues such as eco-management topics. Duncan analysis explained that neither the scientist nor the politician takes the final decision. The conclusive decision is discussed on a democratic and multi-stakeholders board where the last choice rests upon the community representatives. Therefore, the role of the community needs to be empowered while politics and science have to support it rather than lead the decision making process. When the community gets involved in the decision tree each component is important and needs to be encouraged. This will enable a social awareness, which bonds the community participants, helping to recognize common over personal interests. This process can potentially result in a democratic and modern way to recognize the right to a healthy environment in New Zealand. As highlighted by Scott Pearson, some of the latest experiences of communitarian decision have been unsuccessful. Because of this, there is a need to raise social awareness, especially about the eco-management issues. From Latin, eco means house, and as in a house, collaboration is the only way to get to achieve sustainable management for our ecosystem. In conclusion, the social awareness of good eco-management practices is the first step towards the development of a democratic wellbeing including our ecosystem. Despite New Zealand’s need to reduce greenhouse gas emissions, Fonterra is planning to burn more coal. Tim Jones from Coal Action Network Aotearoa asks for your help to stop them. No time to read? You can go to to http://www.actionstation.org.nz/nonewcoal and sign Coal Action Network Aotearoa’s open letter to Fonterra. Many people know that the rapid expansion of the New Zealand dairy industry, egged on by global dairy giant Fonterra, has caused many environmental problems, including severe damage to many of our waterways and a major increase in agricultural greenhouse gas emissions. But there’s something you may not know: dairy giant Fonterra is New Zealand’s second biggest coal user, burning more than half a million tonnes a year to dry milk powder. Its coal use has increased 38% since 2008. And Fonterra is planning a big increase in its use of coal. It plants to build more coal boilers to let it dry even more milk powder. Whatever you think of Fonterra’s economic strategy, Fonterra’s coal expansion plans have to be stopped. And that’s where you can help. Fonterra wants to be seen as clean and green. It doesn’t want to be branded as a climate criminal. If enough of us speak up now, we can turn Fonterra’s plans around. Fonterra doesn’t have to use coal. It could use wood waste instead. Fonterra has just applied for consent to build a huge new milk drying plant at Studholme in South Canterbury with four new coal boilers. But there are other ways of getting the heat it wants. In forests around the region, mountains of waste wood – branches, broken logs, prunings – are burned on site or left to rot. There are companies who collect this and supply it as fuel to industry. It is being used already in greenhouses, hospitals, schools, and other industries around the country. Fonterra – like the rest of the world – needs to phase out coal. But the decision point is when you design the boiler. To get the best performance, and to be able to use the cheapest fuel, the boiler needs to be purpose-designed for wood. Some boilers built in the 1970s are still being used to dry milk. Designing these four new boilers at Studholme for coal will commit Fonterra to increased coal use for at least another 40 years! 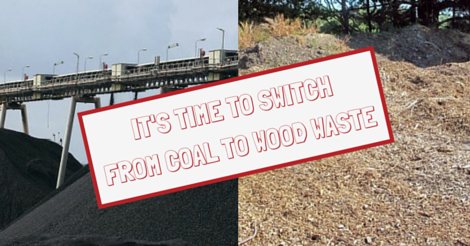 We call on you to commit to “no new coal boilers” – that is, to use wood waste, not coal, in the new boilers you’re currently planning, like at Studholme. Then, we want Fonterra to commit to, and fully carry out, a programme to phase out coal boilers and move to wood waste at its existing plants as they age. Now is the time to make a difference. The Studholme project doesn’t yet have consent so there is time to change design. The Fonterra Board meets in November. Sign our open letter to Fonterra Chair John Wilson. Caroline Glassberg-Powell reflects on how dairy intensification is causing New Zealand rivers to become the most polluted in the world. There were many themes at this year’s annual ECO conference. Perhaps the most controversial and eliciting the most outrage was how dairy intensification is causing our rivers to become the most polluted in the world. Dr Mike Joy presented on how bad the rivers are really becoming, and how governments are constantly changing the goalposts to deceive the general public. The deteriorating conditions of our rivers is impacting upon public health, as Dr Alistair Humphrey revealed, and all of this is needless given that intensification does not have a solid economic case as argued by Dr Alison Dewes. Even when the government admits there’s a problem, Al Fleming explained with his work on the Waikato, it’s still a fight. The quality of New Zealand’s waterways is amongst the worst in the world, in no small part thanks to dairy intensification. Before the Europeans arrived to NZ, one third of the country was wetlands. Now, we have lost 99% of our wetlands, which means that whilst dramatically increasing our outputs into the environment, the environment’s ability to take-up and process those nutrients has all but disappeared.The intensification of dairying is putting so much pressure on our waterways that we are in a precarious position with degraded, dangerous rivers and streams which are barely safe to boat or wade in, let alone to drink or swim. All of this is needless, given that the economic case for dairying follows the laws of diminishing returns: more inputs past a certain point do not lead to more profit. We have far surpassed that certain point, and are now crashing down the other side. Each cow produces waste equivalent to around 14 people, which means that, across New Zealand, cows are producing the waste of approximately 90 million people. The waste has to go somewhere, and that somewhere is invariably the waterways and ground water of Aotearoa.The impacts of the waste are numerous, but sedimentation, nitrogen (N), and phoshorus (P) in particular have far-reaching consequences. When a cow pees, if the land on which it pees is not at capacity, the plants and soil are able to absorb the content of the urine. However, when over-stocked, the plants are at capacity, and the excess nutrients spill over into local waterways where they cause many problems. The solid content of urine and faeces when in rivers cause many problems. The solids dissolve in the water and are carried along by the currents, and once the waters slow down, the sediment is deposited. Both suspended and deposited sediment cause problems in their own right. Suspended sedimentation can clog fish gills, which suffocates them. The sediment also reduces the clarity of the water, which reduces the amount of light in the river. Not only does this render fish unable to see, but it blocks light from reaching plants, preventing their growth. Reducing plant growth decreases insect and fish levels, and reduces the number of habitable areas. Deposited sediment also reduces the number of habitable areas by changing flow patterns, blocking migratory routes, and suffocating bed life. The detrimental effects of sedimentation are also being seen in ocean fisheries, which is impacting social and economic well-being. N and P are also impacting the health of our waterways. Since they are growth-promoters, too much N and P causes algae to bloom, which covers the rocks in slime. The slime renders previous habitats uninhabitable for fish, leaving fish fewer places to live. The fish, in fact, are doubly affected by the algae blooms. As algae intensifies during the day, the water becomes saturated with dissolved oxygen. However, at night, photosynthesis stops and levels of oxygen become extremely low, which is deadly to aerobic organisms like fish. A healthy river has stable levels of oxygen; an unhealthy river has wildly fluctuating levels and fish are unable to survive. Very low levels of N are required to see these patterns: as little as 1.2 mg / L. The oxygen-deprived waters also promote growth of bacteria which are deadly to humans. Cyanobacteria form thick mats in the river which, when ingested, have killed dogs, horses, and humans. When we extract this water for drinking, as many communities across New Zealand still do, we are putting ourselves at risk. In particular, new-born babies can suffer greatly from the high levels of nitrogen in the water. Foetuses have a special type of haemoglobin which binds very tightly to oxygen. When a baby is born, it takes a few months to replace this special haemoglobin, and in that time they are susceptible to blue-baby syndrome. Their haemoglobin binds to nitrates more strongly than oxygen, which means if they consume too many nitrates, they will no longer be transporting oxygen around their body, and they die as a consequence. Breast-fed babies will not be affected, but bottle-fed babies will be. This means that babies dying from the syndrome will be disproportionately poorer, born to working mothers. Historically in this country there have been low cases of blue-baby syndrome because of good policy on nitrate levels. However, high risk areas are now expanding, in accordance with dairy intensification, and there’s no evidence to suggest the situation is improving. As climate change hits, increased temperatures will further promote the growth of cyanobacteria, and more dairying will of course increase these issues. E.coli. is also a big player in waterborne pathogens. It is reported that 34,000 Kiwis are infected every year, although due to lack of reporting, the true figure could be much higher. E.coli. can put people on dialysis for life, the cost of which can be astronomical. Treatment of water, caring for people made sick from poor quality water, and generally cleaning up after cows is extremely expensive. A recent paper published by Dr Joy and others shows that cleaning up after the dairying industry costs more than the industry adds to our GDP. The best solution is stop intensification. Dr Dewes presented a graph which shows government thinking to be: more inputs = more outputs = more profits. However, the environmental effects of more inputs were “managed” out of the system somehow, tapering off at around the levels we are currently at. That thinking is not based on fact, but on a flawed ideology. As land becomes more degraded, more and more inputs are required to produce outputs. If we follow the growth agenda to the letter, more and more marginal landscapes will be exploited, which will lead to further sedimentation and run-off. This has happened in Canterbury, and now 70% of the region is classified as deteriorating. Scaling down is the best economic and environmental decision farmers can make. Yet, this flies in the face of governmental advice which is to increase intensification and irrigation in the Canterbury region. Government priorities are set by GDP, which is a crude measure of the country’s success, and is gamed for short-term growth only. The best level of stocking for the environment and the economy is approximately 1 cow per hectare. At this level, the system can provide for itself. Any higher and we need to import masses of protein, as New Zealand currently does, and we are now the world’s largest importer of palm kernel. This offshores a lot of environmental impacts, and contributes greatly to deforestation in the developing world. It is also extremely expensive for the farmers to import, and reduces their profit margins. As it is, it’s expected that most dairy farmers are running at a loss (http://www.radionz.co.nz/news/rural/278327/most-dairy-farmers-will-run-at-loss-this-season). Stopping the destructive import, however, will reduce GDP because the palm kernel industry will be affected. That’s but one example of the crudeness of GDP, which fails to consider regional variation. Instead of taking remedial action to address these issues, the government has reclassified what it means for a river to be “safe”. The now accepted level of N in a river is 6.9 mg / L, well above the levels at which negative impacts start to occur. Rivers which, by all accounts, should be on the lowest grade possible under this system, are scoring excellent or very good. The classification has come in simultaneously with changes in the ways that rivers are monitored. Instead of using continuous monitoring, measurements are only taken at times of day when the oxygen levels are at their best, which prevents us from building a realistic picture of wildly fluctuating oxygen levels. Additionally, sites which perform badly are simply taken out of the sites which are measured. Even the measurements taken skew the results: only suspended sediments are measured, not deposited sediments. All this bad science led to the government producing a document in 2013 claiming that rivers are stable, or even improving. On complaining to the MfE, Dr Joy was met with an adamant refusal to clarify this with the public. Even when the problem is acknowledged, and money is provided to clean up the waterways, resistance still abounds. There has been $210m set aside to clean up the Waikato, where 75% of the land-use is dairy. However, the bar has been set very low, to wadeable, not swimmable. Lake Waikare, for example, is very shallow with high sedimentation, hypertrophic, and water clarity is 1 m instead of its recommended 1.6 m. Yet, recent discussions for a moratorium on conversion from forests to dairy has been stalled as out of the scope of the restoration. Furthermore, an index which is globally recognised for measuring the health of waterways, the macro-invertebrate index, has been denied for use with the excuse that it’s a biotic measure, not a chemical one. The state of New Zealand’s waterways is pretty dismal. We have a government insisting on intensification, against all mounting evidence which suggests this is a bad strategy, and they continually move the goalposts to mask the very real problems that we are facing. Ecologically, socially, and economically speaking,we are finding dairy intensification is causing very serious problems, and no amount of reclassification can change that. Now we know that, we should stop this land conversion until we find genuine solutions to the problems. As Dr Joy said, “you can fool yourself, but you cannot fool the ecosystem”. ‘Let us turn vulnerability into value’. The Pacific region is often viewed as vulnerable and distant, and defined by isolation. Yet Peoples of the Pacific, the Water Continent, are resilient and resourceful. Drawing from traditions of engaged governance, laws oriented to collective accountability, and capability of traversing and living from ocean environments we are at the frontline of sustainable societies. Because environment is integrated with economies, climate is at the forefront, and public trust law could pave the way for bringing responsibility back to corporates and systems of government. The Symposium was co-hosted by UNU RCE Waikato (Regional Centre of Expertise on Education for Sustainable Development) and Te Piringa, Waikato University Law School. Betsan Martin and Linda Te Aho co-ordinated this multidisciplinary engagement in a proposition for the governance of water. It works with an approach of responsibility for the ecological health of freshwater, provides for commercial use, and seeks to resolve Māori and general public interests. Betsan, Chris Livesey and Diana Shand attended from ECO. The direction was set by former chief judge of the Waitangi Tribunal and Judge of the High Court, Sir Taihakurei Durie, setting out the radical orientation of responsibility for water governance developed through law of trusteeship. His proposal was developed in direct reference to the Charter for Human Responsibilities. Law of public trust in the US, and in Hawaii specifically, is the means by which waterways which were diverted for the sugar industry are being returned to their natural courses with flows which support original indigenous crops. Traditional agriculture was decimated by the industrial water regime. Hawiian legal counsel, and now academic Kapua Sproat gave a strong lead from her case law experience to set out prospects of law for public goods, including water and climate. Another law that deserves attention is the US Clean Air Act (1970), a federal law to address emissions of hazardous air pollutants. It requires the Environmental Protection Agency to give effect to the maximum achievable reduction of emissions with the use of technology. As Neetu Sharma said, law can be transformative as well as regulatory. State responsibility, not the absolute power of that sovereignty implies, is more appropriate for the modern world. Indeed, if it is true that that Māori ceded sovereignty, then I think they did the best thing to give it away. It has simply been the cause of too much strife and war (Durie 1996. View Point: Taku Titiro. He Pukenga Korero). With attention to water and climate a starting point of policies to address pollution led into a critique of polluter-pays policies as a premise for incentivizing business, including agriculture, to manage land and water in accordance with ecological health. In reality, polluter-pays policies can simply be seen as a business cost that does not deter carbon emitting industry or other pollution producing systems. In other words, they serve as a right to pollute. For this model, regulation designed for responsibility for ecosystem health with management of inputs and incentives to optimise water bodies would be the imperative. Pierre used the powerful idea that exchanging responsibility for money can be replaced by recognition of carbon wells, or carbon sinks, as a global commons. As such all individuals and territories would have equal quotas for emissions. Quotas would define the maximum carbon limit and be tradeable. The move from ownership to stewardship strikes at the heart of the transformative proposal for water governance. Although the New Zealand government has a theory that ‘no-one owns water’, here, as in other places, water is managed under regimes of rights through allocated consents. These ‘use rights’ are effectively a form of ownership, and they do not impose the responsibilities of stewardship. The Durie proposal for trusteeship of water recognized Māori propriety interests and at the same time moves the issue of settlement to the arena shared responsibility for water as a common good. It inaugurates a governance regime with responsibility for ecosystem integrity, and has capacity to work with collaboration. A public trust regime would be managed through a Commission of representative trustees. A price for commercial use of water would generate revenue to be directed to land management to reduce contamination generated from agriculture, to restoration and to water conserving infrastructure. Much of the detail is in development. There is more magic to the Durie plan. It is designed to reconcile Maori indigenous interests as well as general interests. We don’t have borders in New Zealand, but this is a platform for cross-boundary agreement on shared responsibility for water. Māori have had their traditional water –based food sources and authority over water taken during the British takeover, and redress is still being sought. Although there are many proposals to set standards for water, manage allocation, to settle Māori interests and even collaborative agreements for environmental and corporate interests, none are designed to reconcile different interests and claims through stewardship and responsibility. A custodial voice is arising from the Pacific region with regards to common goods and climate justice. This is probing the traditions of the oceanic peoples which were founded on a ‘sacred balance between humans and environment where the environment was believed to be kin’. This understanding of interdependence given by His Highness Tupua Tamasese, Head of State of Samoa, was further underlined by him: ‘it is my contention that in sidelining our indigenous reference we have made it easier to walk the path of environmental destruction’. Tamasese spoke of bringing the values of forebears to the forefront of our minds, and re-energizing and re-casting them to suit the new global order. Tamasese drew on traditions of engaged citizen participation, the ‘Tulafono’ process for decision-making. New Zealand has examples of processes of dialogue, or collaboration, about to be legalised for fresh water, and Co-Governance arrangements for rivers and National Parks. Climate impacts on Island nations are forcing a re-evaluation of industrial preferences. In a move that turns vulnerability into value, the Small Islands Developing States Conference asserted the Pacific region as being on the frontlines of climate change – because it is clear that resilience can only be achieved where economic development is aligned with environmental protection. The Pacific is becoming known for the blue economy, with oceans as the main sources of food and sustenance and trade and connectivity across large water spaces. The navigational skills of ocean voyaging are being re-activated as a message of sustainability. Appropriately, just before we met for the symposium five traditional vessels sailed into Sydney harbour for the World Parks Congress. Taholo Kami, Director of IUCN Oceania came to the Symposium after welcoming the vessels at Sydney, carrying a message of sustainability from Pacific navigational systems. Try a few seconds on the Pacific ocean voyage here http://youtu.be/m6YaQFNKg80 In December the five waka were in Auckland. Taholo travelled via Papua New Guinea where a new framework of Responsible Economic Development is being put in place. With climate change at the forefront 2015 is the opportunity for Pacific countries to take a lead in the responsibility approach for COP21. Taholo envisages linking Pacific rim countries with Pacific Islands, which bear the risk and face annihilation from climate impacts coming from Pacific Rim economies. We were treated to a remarkable review of the Western legal tradition to discover the persistent thread of the concepts of duty and responsibility in law, and how these were overtaken by trade and capital interests, starting with the East India Company in 1600. The colonisers saw the development of private property, individual political representation, and self-interest as the core of economic theory. The accumulation of capital wealth, and even human rights, consistently privileged freedom over duty – freedom in this case meaning freedom from constraint as an incentive to market engagement. Professor Gay Morgan asked ‘ Where has the West Gone Wrong’ ? As trade and corporate industry grew from the 1700’s, gains were made for civil and political rights, but not civil and political responsibilities. Notions of collective duties were dropped and free reign was given to the individualised concept of corporate market capitalism. Activating engagement with the Durie discussion paper on water will involve seeking further commentary. Emerging issues are to work with Iwi, to seek advice from NGOs such as ECO, Forest and Bird, Land and Water Forum, and to further test the proposal with business, government ministries, and regional government agencies. Considerations of pricing, definitions of need, control of inputs from dairy and land activities and forestry, and the RMA, are all to be developed. Papers and videos will be published electronically and as a book.